RatcliffeBOSTON, Mass. (June 8, 2016)—Thomas Ratcliffe (Concord-Carlisle, MA), who last week broke the Massachusetts and New England high school records for the mile when he ran 4:01.50, will compete in the adidas Dream Mile, organizers announced today. The adidas Dream Mile, which produced five of the six fastest high school times in the country last year and in 2011 saw Lukas Verzbicas become just the fifth U.S. high school athlete in history to run under 4 minutes, was formerly part of the adidas Grand Prix in NYC. A world-class event featuring Olympic and World Champions, the meet has been re-christened the adidas Boost Boston Games, a two-day festival of world-class track and field. On Friday night, Dilboy Stadium in Somerville will host races of 400 meters and up, including the rare opportunity to see two-time Olympic gold medalist Meseret Defar of Ethiopia chase a fast time at 10,000 meters. On Saturday, the adidas Boost Boston Games will shift to Charles Street in Boston, where the first “street meet” of its kind in the U.S. will be highlighted by 2012 Olympic gold medalist Jenn Suhr in the pole vault and 2011 IAAF World Champion and two-time Olympic silver medalist Yohan Blake of Jamaica at 100 meters. Tickets and more information are available at http://www.adidasBoostBoston.com. 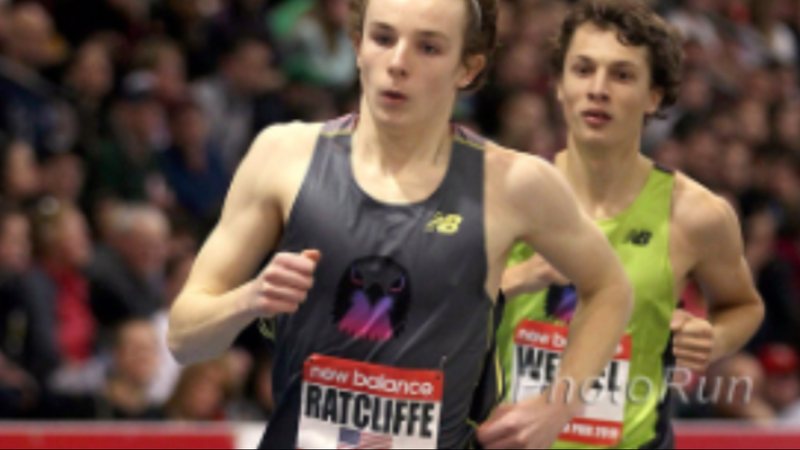 Ratcliffe, whose time of 9:00.52 in winning the state title last weekend is #1 in the U.S. this season for 2 miles, also won the 2016 state indoor mile title in a state and New England record 4:06.92. He was runner-up at 2 miles in the 2016 national indoor championships. The athlete whose state and New England record Ratcliffe broke, Garrett O’Toole, will also compete at Dilboy. O’Toole, formerly of the Middlesex School in Concord and now at Princeton, will run in the open 1500 meters, in which he will try to attain the U.S. Olympic Trials qualifying standard of 3:38.00. The adidas Boost Boston Games is produced by Boston-based Global Athletics and Marketing, Inc., an athlete-management and sports marketing firm that from 2005 to 2015 served as organizer of the adidas Grand Prix in NYC and since 1996 has given Boston fans an annual, world-class indoor meet at the Reggie Lewis Track and Athletic Center at Roxbury Community College. More U.S. and international stars and further details on the adidas Boost Boston Games, the fifth stop of the 2016 USATF Championship Series, will be announced soon on the event website at http://www.adidasBoostBoston.com; on Facebook at adidasBoostBostonGames; on Twitter at @adidasBoostBos, and on Instagram at adidasBoostBostonGames.